It’s been a tricky week already. One of our dogs is feeling poorly, and oddball stuff keeps cropping up at work. Oh, how I wish I had a magic wand to make it all better. Oh wait…I do! 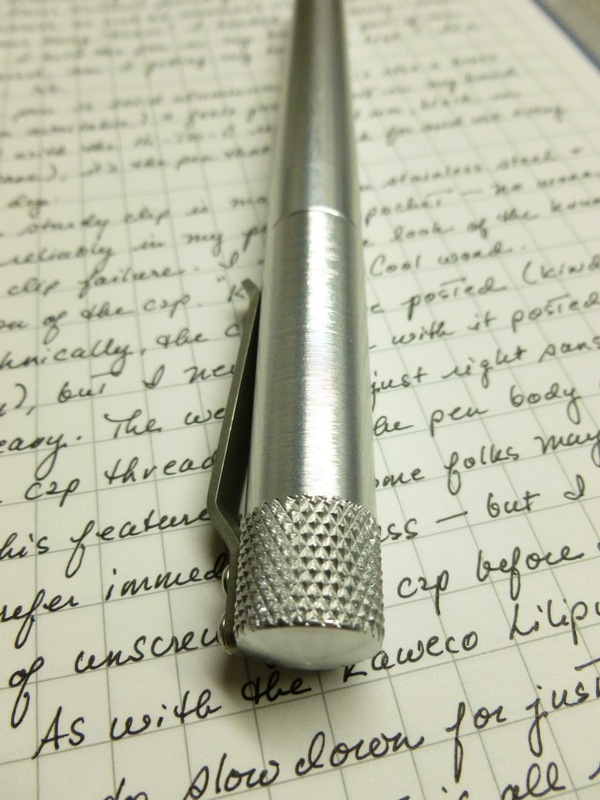 The InTuition Pen/Stylus, a Kickstarter project by e4 Labs, arrived last week, overdue by only about a week. In contrast to the project that I wrote about last week, this one has been a great experience for the backers. Updates were frequent and full of pictures. Even when there was a bit of an issue, we were kept fully informed. You can’t ask for much more than that. The first thing I noticed is that the pen resembles a magic wand. I haven’t managed to pull a rabbit out of a hat, but I must admit that I have been known to wave it around a bit, hoping to cast a spell or two. The straight lines of the carbon fiber body and titanium cap make that action impossible to resist. Even though I haven’t conjured up any real magic, I’m transformed into a marvelously relaxed worker when I’m using the InTuition. That counts as a “trick,” doesn’t it? It’s a pen! It’s a stylus! 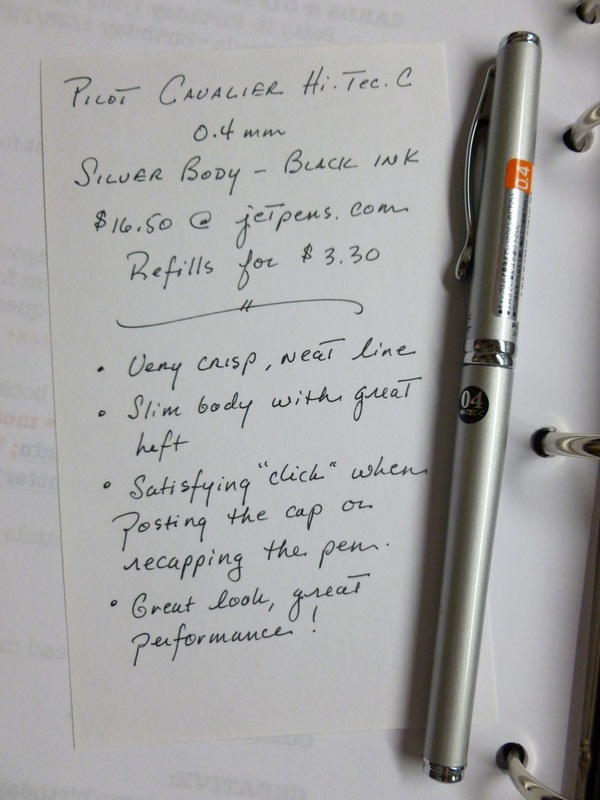 The pen takes the beloved Pilot Hi-Tec-C refill, which means that you’re able to swap in your favorite tip sizes and ink colors. 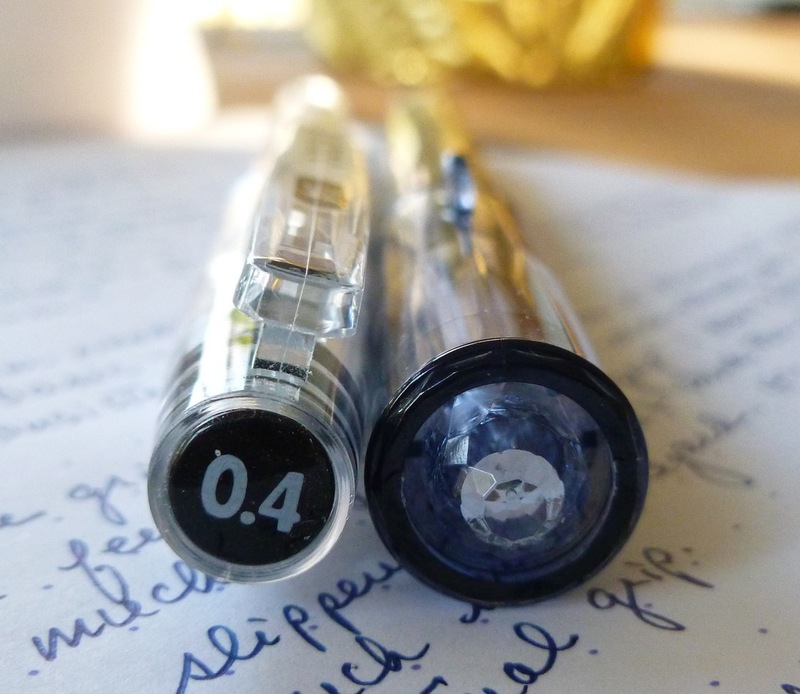 I’m using a black 0.5 mm refill, but may kick up my heels at some point and go for something wacky…like blue. Or brown. Or green. 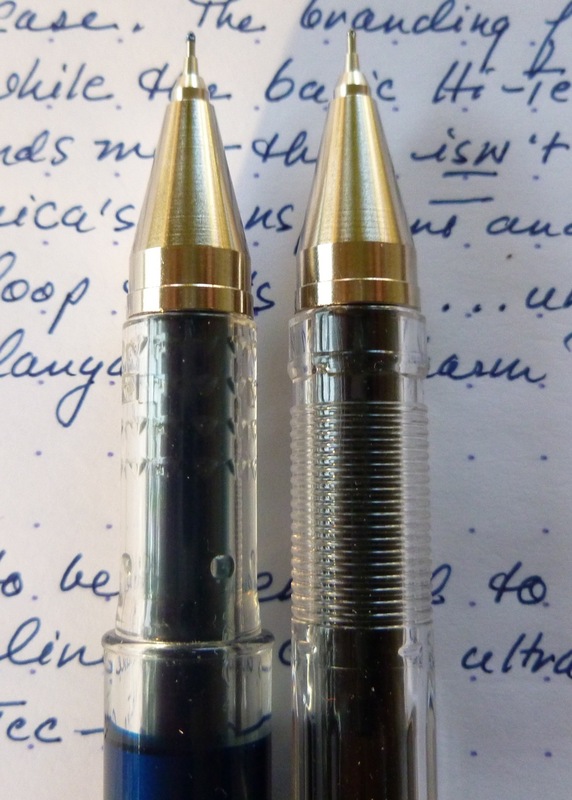 The two o-rings that you see on this end of pen provide just the right amount of grip, while also ensuring that the slip cap fits snugly. The fit is just awesome. On the other end of the pen is a Wacom Bamboo stylus nib, which is commonly available to allow for easy replacement, should the need arise. I’ve used the stylus on my iPhone and and iPad and am very happy with the performance. 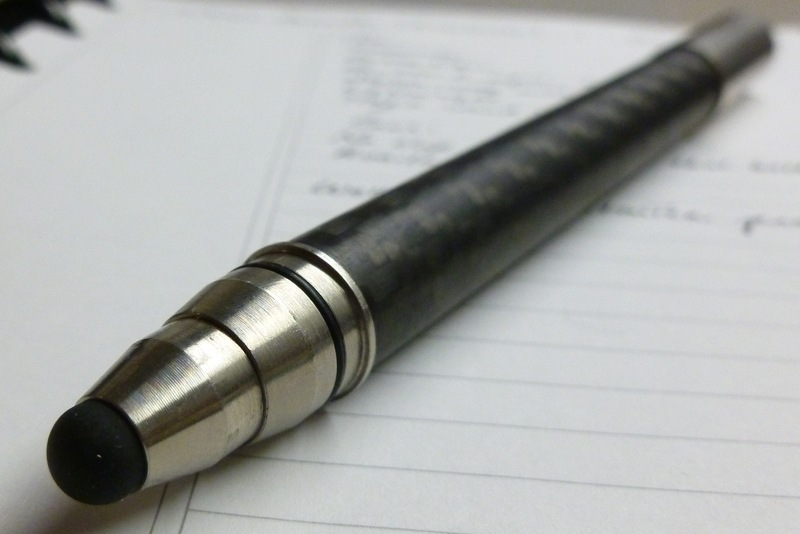 I still think that the stylus on the Solid Titanium Pen is stylus #1, but this one is VERY close. A single o-ring on this end of the pen keeps the cap in place when posted. 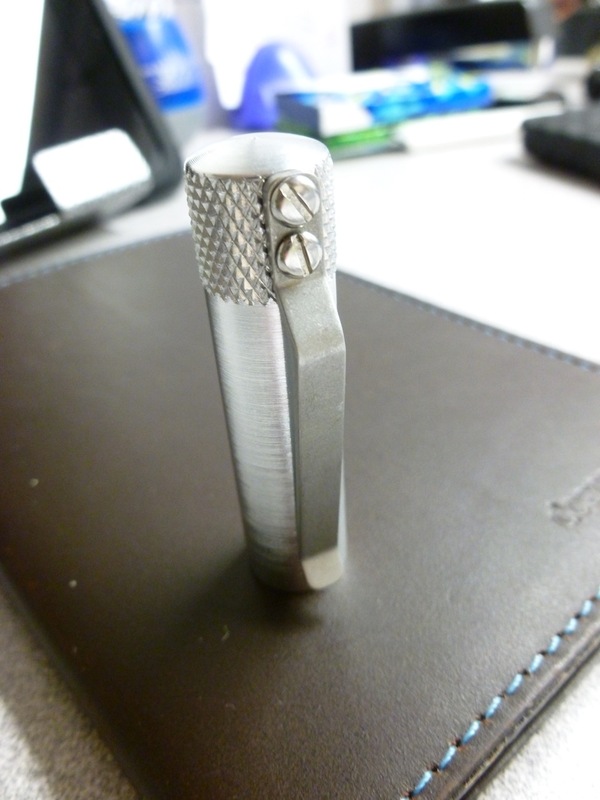 A titanium fitting simply unscrews to expose the tip for replacement. Weighing in at 27 grams (just under 1 ounce), the InTuition measures 5.75″ (146 mm) from the end of the cap to the end of the stylus. 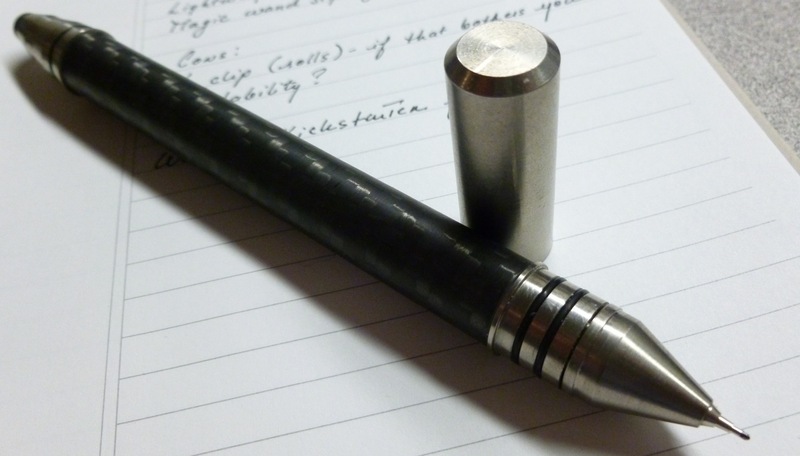 Uncapped, the pen measures 5.56″ (141 mm). 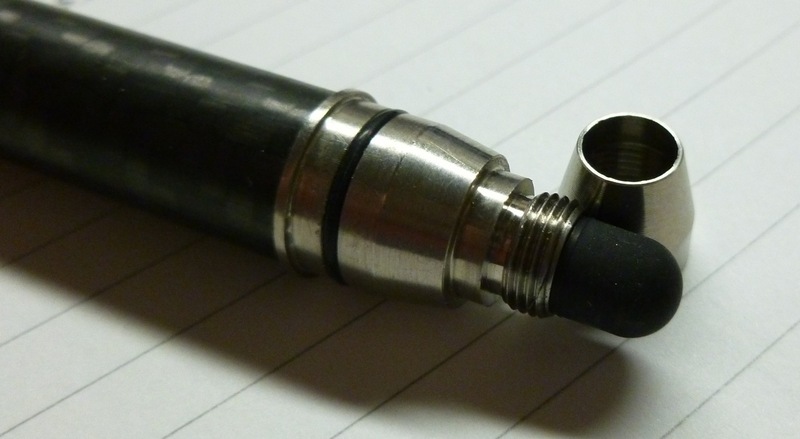 The carbon tube body is 0.45″ in diameter, while the cap measures just a bit more at 0.49″. 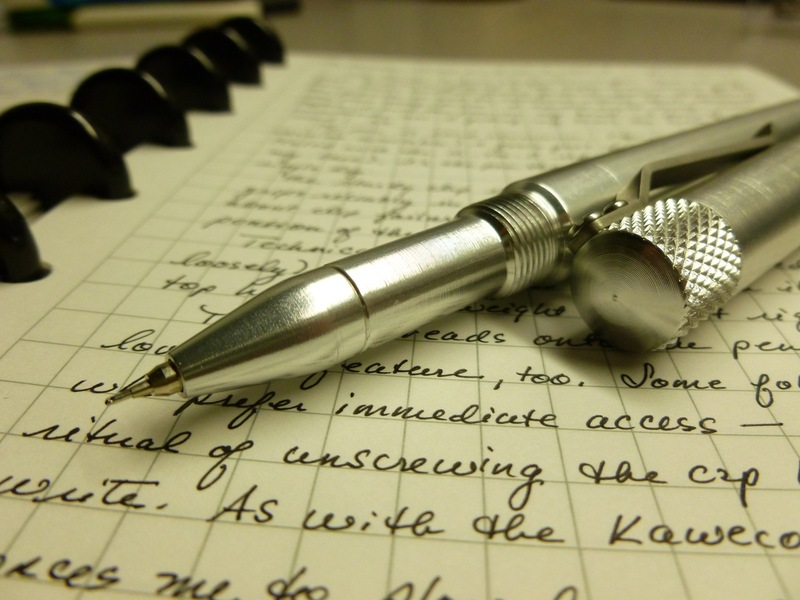 The pen feels great in hand, writes like a dream, is American made, and looks industrially cool. So are there ANY negatives? Hmmmmm. 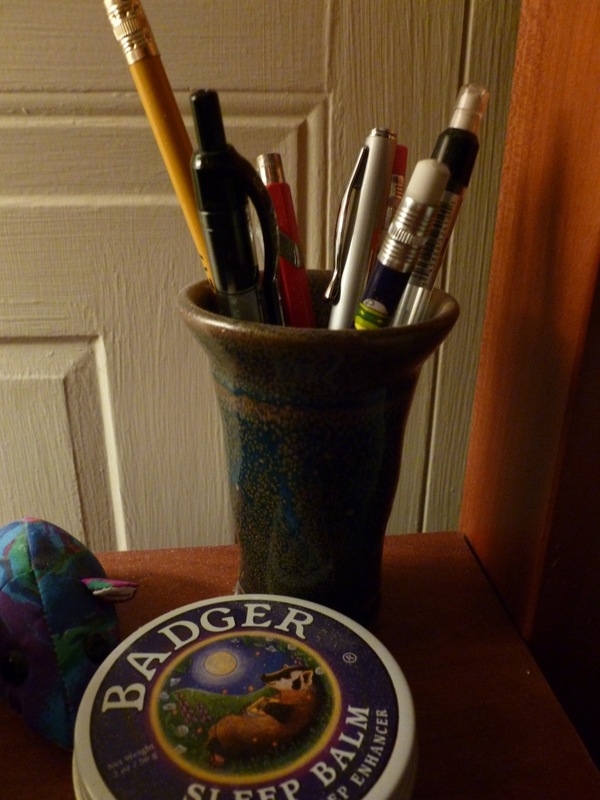 Without a clip, the pen does have a tendency to roll, and I’ve lost it off of my desk a couple of times. Don’t get me wrong, I think a clip would ruin the aesthetic, so I don’t miss it at all, but some may consider that an issue. The biggest problem appears to be availability. Since the Kickstarter project is over, I’m not sure how you would obtain an InTuition as I don’t see them commercially available. Probably your best bet is to contact Tom at e4 Labs, via the Kickstarter page, if you want to get your own. And you should, because, despite the fact that it can’t make problems or complications disappear, it really is WANDerful. 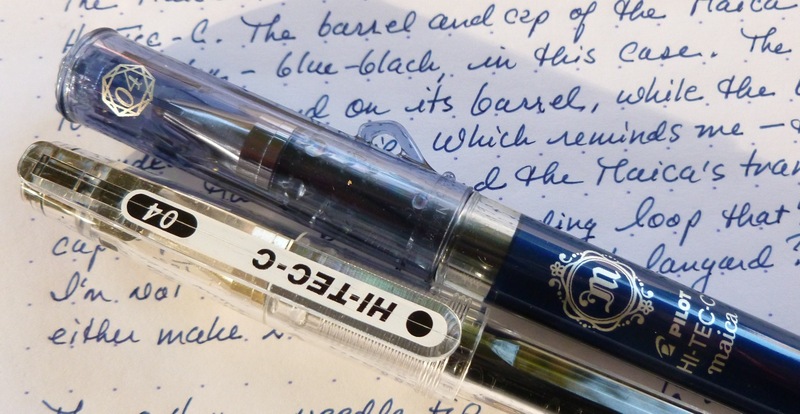 Thanks to THE Pen Addict (Brad Dowdy), I’ve grown to love the sharp, sharp tip of the Pilot Hi-Tec-C. 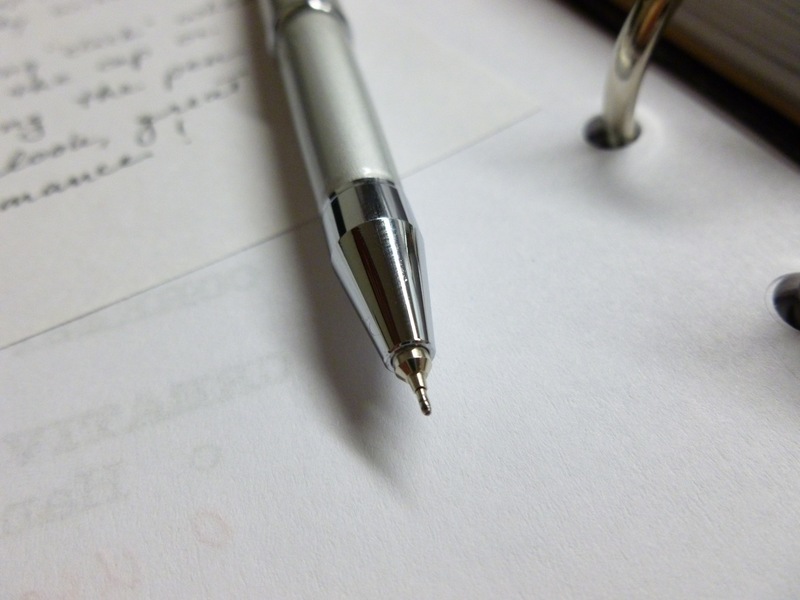 I recall using a fine-point Bic in junior high and hating it, so I steered clear of fine-tipped pen for decades because of that bad experience. 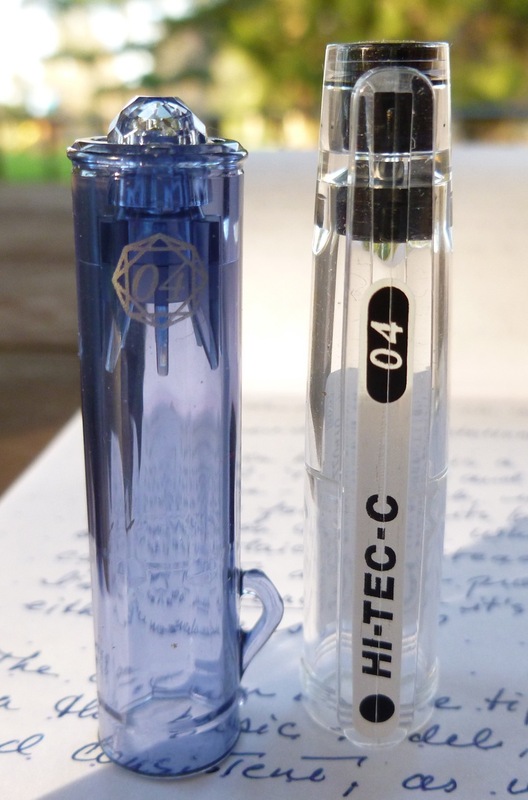 Brad’s love of the Hi-Tec-C encouraged me to try one for myself, and wow, this is no Bic. I love this pen so much, either as is, or as a refill housed in another body (ala Karas Kustoms Render-K), that I regularly stock up on pens and refills at JetPens. 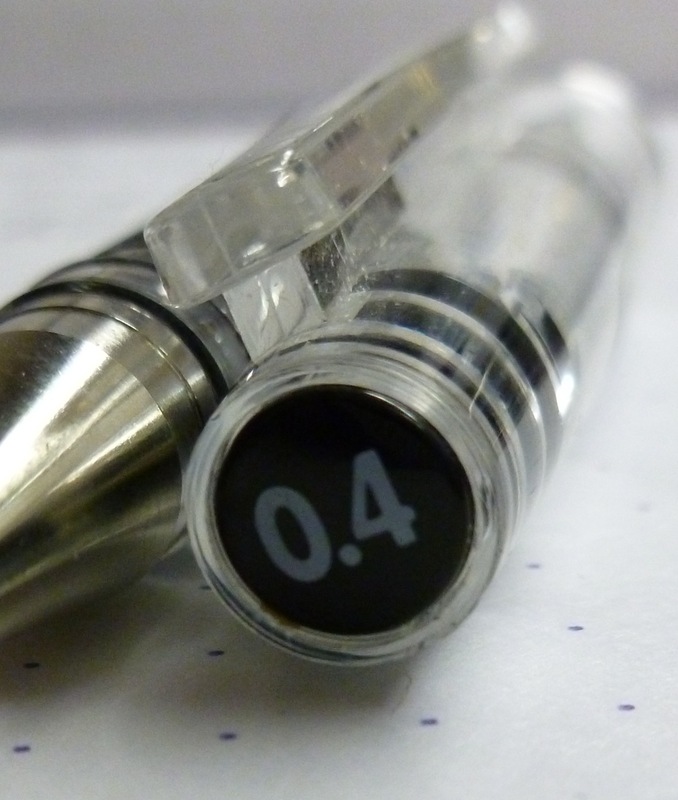 I’ve started giving some to pen-worthy friends, especially those who I think might appreciate the super precise line of the 0.4 mm needle tip. Without fail, my friends become instant Hi-Tec-C fans. 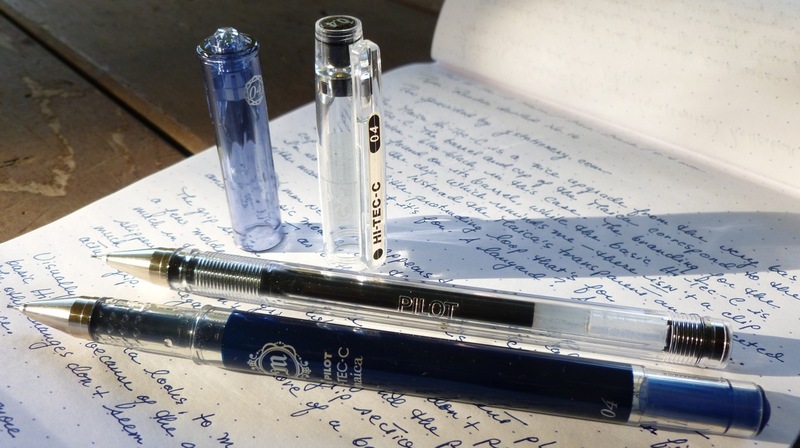 I’m now, it seems, a Pilot Hi-Tec-C pusher. 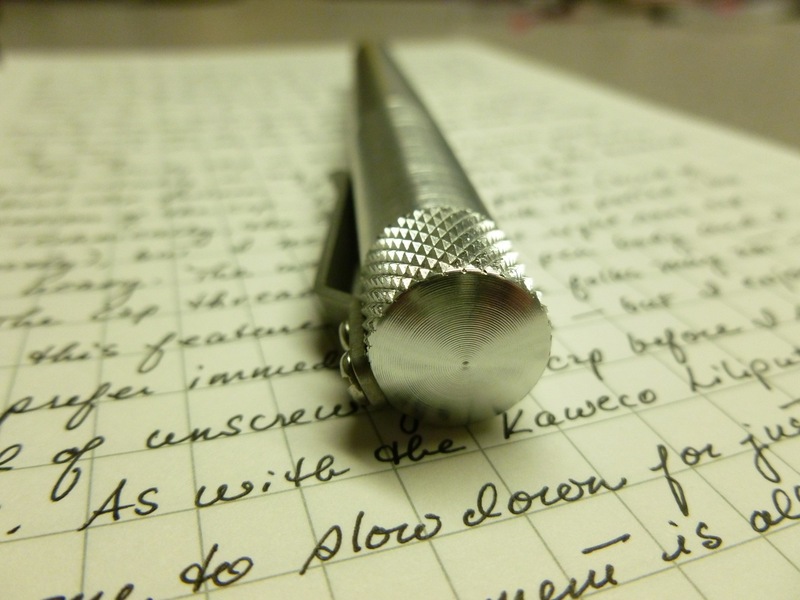 The 0.4 mm tip is the sweet spot for me…super crisp and sharp, without being draggy or scratchy. 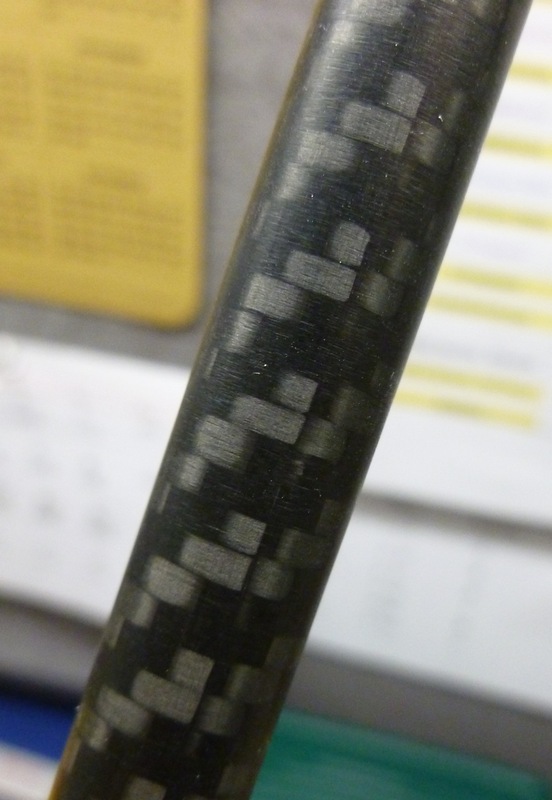 Okay, there probably IS a hint of scratch (it is a needle, after all) but it’s a scratch I enjoy. 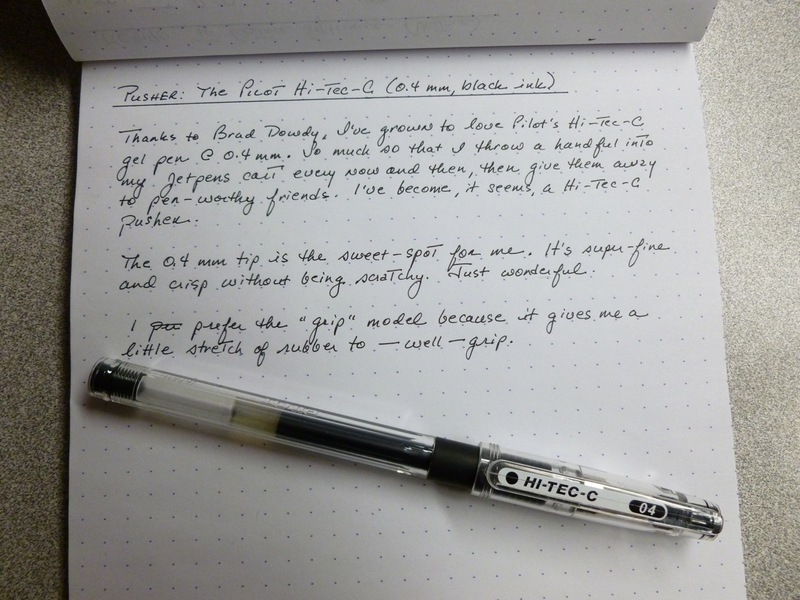 The Pilot Hi-Tec-C. Simple, but very nice. And very addictive. Wishing all of my US readers a very happy Thanksgiving. I’m looking forward to relaxing a bit (once the whole “cooking dinner” thing is behind me!) and curling up with a good book. A good PEN book. 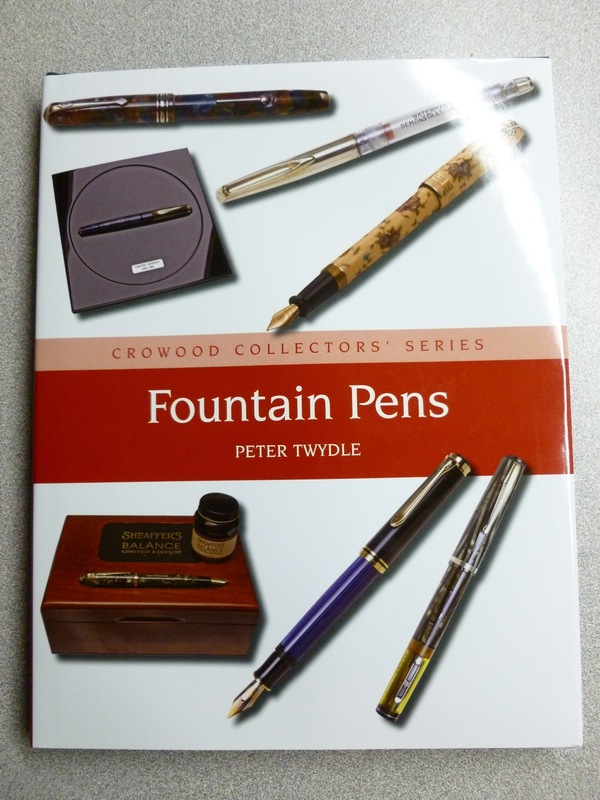 In a recent video, Stephen Brown mentioned that one of his favorite fountain pens books is called Fountain Pens (makes sense) by Peter Twydle. I picked up a copy via Amazon, and though I haven’t spent much time with it yet, I’m getting a kick out of the “old time” ads. There’s a lot of history, terminology, and collecting tips packed into this 160-page volume. Yup…I’m thinking that a comfy chair, a cup of tea, and Fountain Pens sounds better than any “door-buster” Black Friday deal. I didn’t feel like busting a door, anyway. 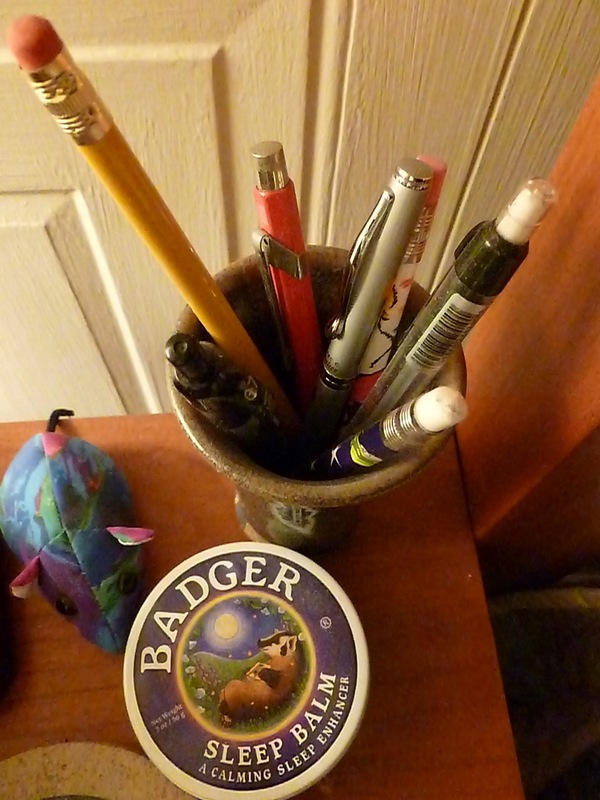 so pens and pencils are not really needed by the bed, but there they are. I suppose a great idea COULD strike at any time. And when it does, I’m ready. 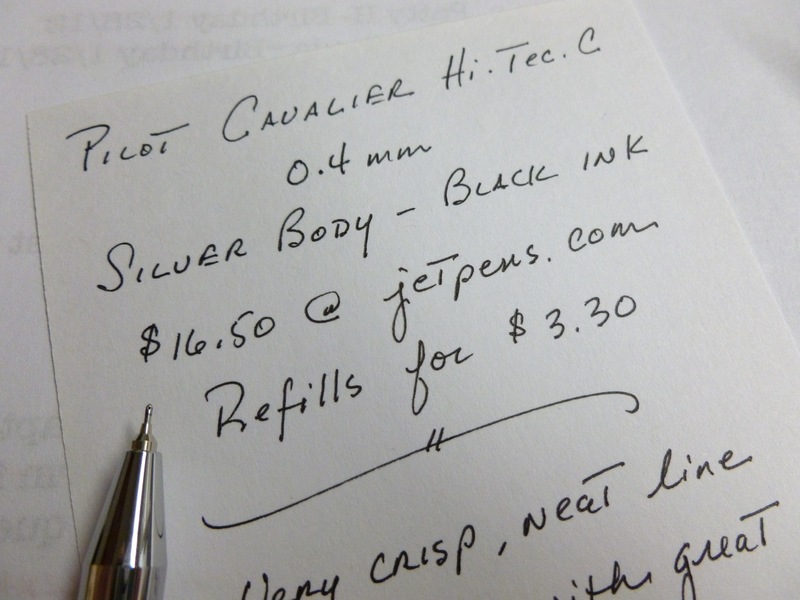 So with the blowing dusting done, I selected the long-neglected silver Pilot Cavalier Hi-Tec-C (0.4mm) from the cup and did a little scribbling on an index card. 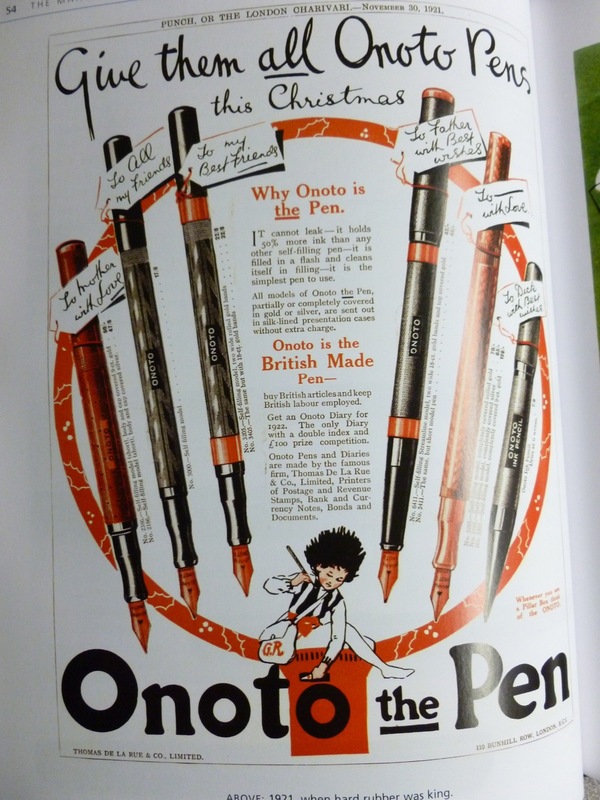 (“WOW…NICE pen.” I think I actually said this out loud.) And it’s been with me ever since. Despite its lengthy stand-by status, it wrote on the first try…crisp, clean, and dark. The body is slim and the lines are classic. 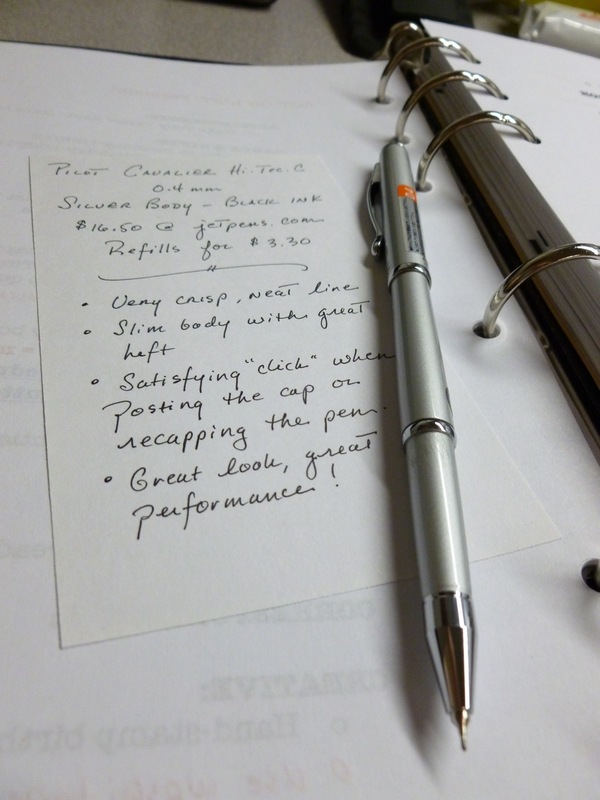 Despite the slim size, this pen feels substantial and weighty (in a good way). Really well-balanced. 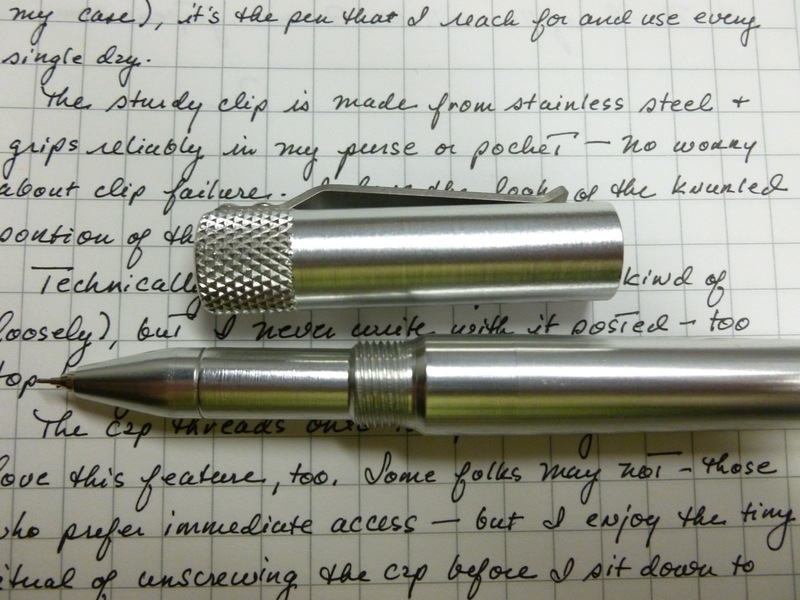 My favorite part of the body is the satisfying way the cap clicks into place when the pen is recapped or the cap is posted. I can’t stop playing with it (sort of like popping bubble wrap). Really, I can’t. 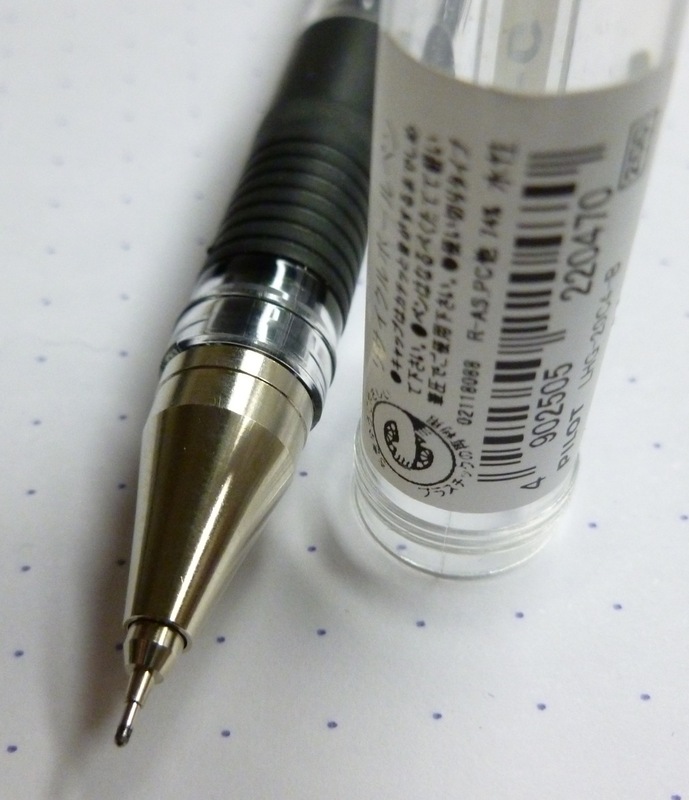 The ink is gel, so the 0.4mm line is fine and neat and smooth. And like I said, it wrote immediately, even after months of neglect. The Hi-Tec-C at work…a true professional. Love the 0.4mm tip. Yup. The lesson here? I should probably dust more often.